Good morning, lovelies! We had such a busy, fun weekend in Utah celebrating my baby brother’s wedding! He tied the knot to the cutest babe, Katie. These 4 little darlings stayed home in Texas with my husband’s parents and I was SO ready to get back home to snuggle them all. We had a fun few days filled with wedding festivities but it feels wonderful to be back home. 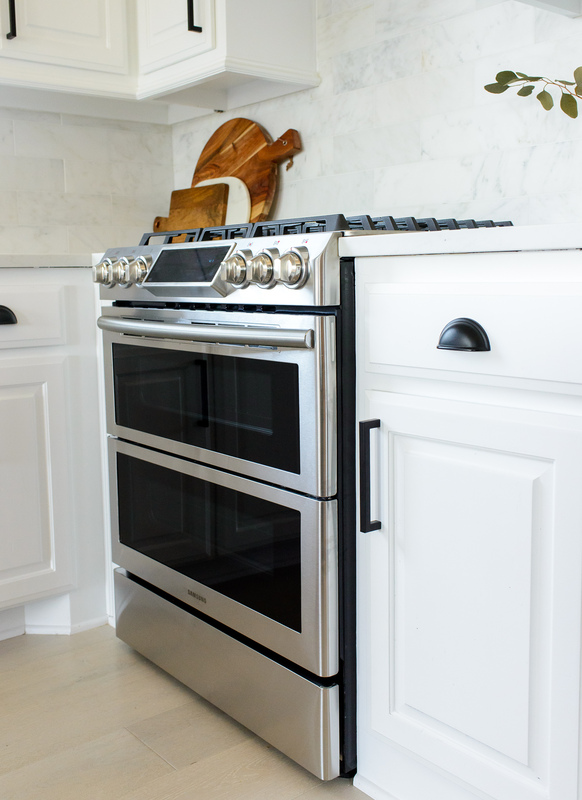 I am SUPER excited to share our review of the new refrigerator and oven we received as part of our kitchen renovation. 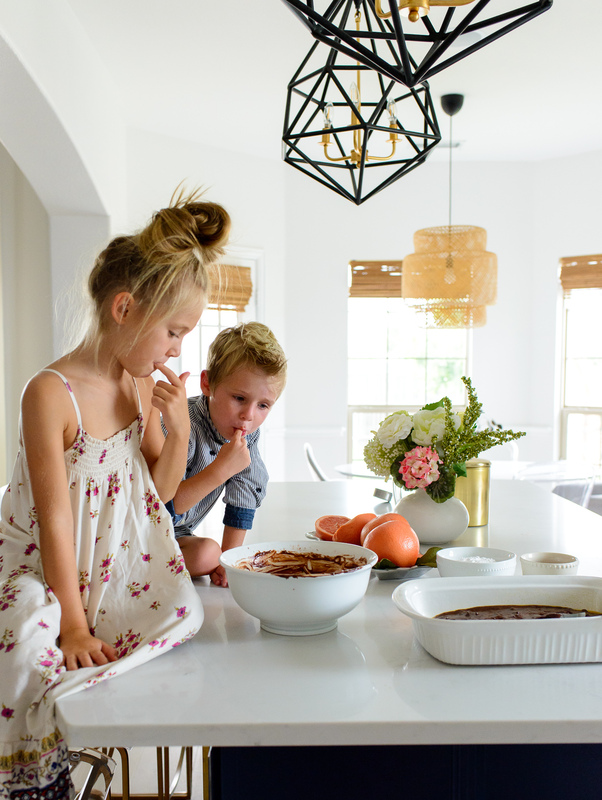 Our family friend, Erica, messaged me last week asking if I’ve shared the scoop on these appliances yet, and since it’s been a few months and we’ve officially broken them in I’ll dish out the details! Here’s a before & after photo of the kitchen renovation we did a few months ago. It was the most exciting and crazy project to manage. See the entire process with tons of photos and sources in this post HERE. Our last refrigerator was bought used off Craigslist 7 years ago when Aaron started dental school. A few weeks after we bought it the water dispenser froze. It would spontaneously turn on a few times during the summer, bleh! Once it began having other issues I explored other brands and styles. 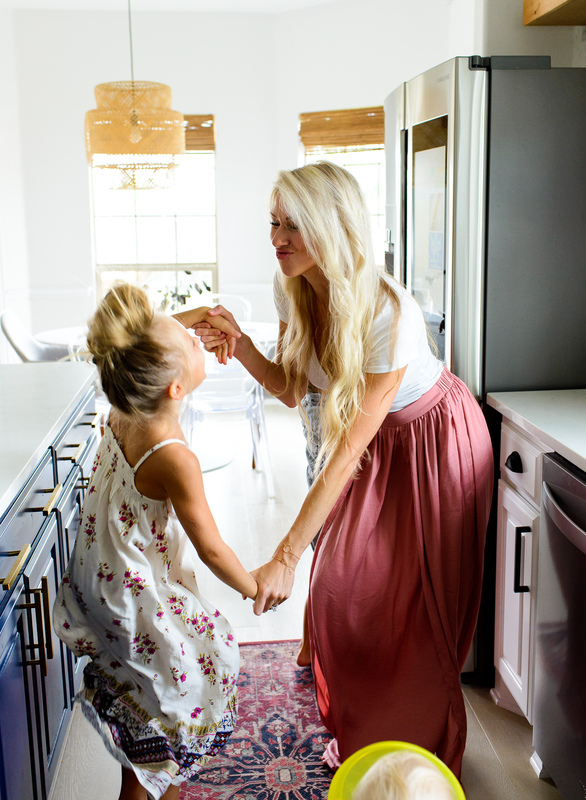 We have LOVED our other Samsung home appliance, the FlexWash + FlexDry that I’ve raved about over HERE and HERE. Simply put, it’s become a brand we trust. 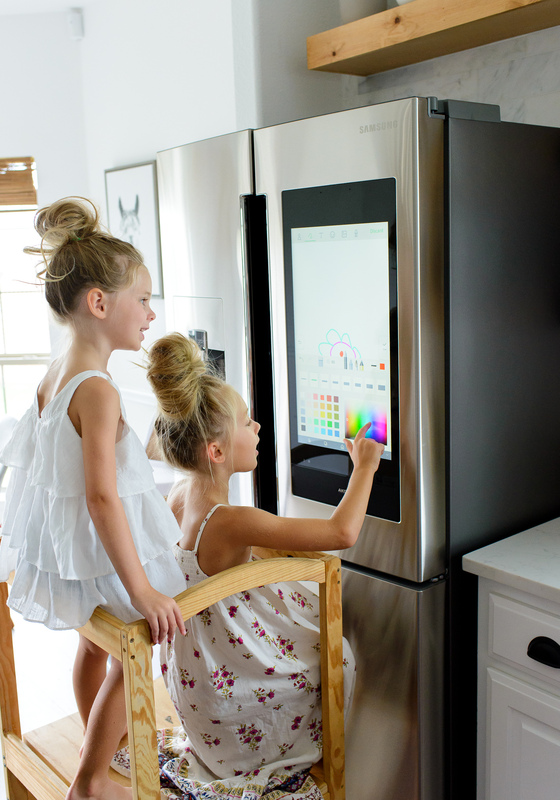 We looked at all the refrigerators on the market and kept coming back to the Samsung Family Hub 3.0. This particular appliance is the crem de la crem of it’s kind. It trumps them all in functionality and creative features. 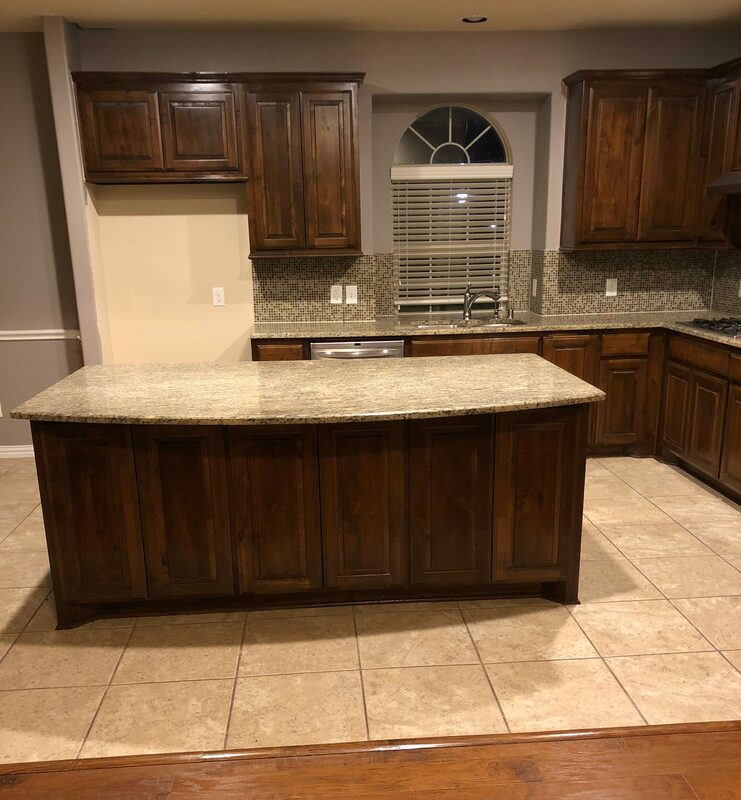 I wanted it to sit back and not stick out far from the cabinets, so we went with the smaller counter-depth style. It’s labeled as “flex” since it has a 4th door that can switch between a freezer and a refrigerator. Pretty neat, right? At 1 point, it was cooled to a refrigerator to hold my sodas (haha!). Now, it’s chalked full of frozen veggies and blueberry waffles. The capabilities of the touch screen are mind-blowing. I cannot recommend it enough. I can pop on Facebook & Instagram while jamming out to our favorite Pandora Station. The kids write notes and scribble pictures all day long. They’ve added it to their list of their TOP 3 things they LOVE about this house and why they never want to move back to the old one! (the other 2 things all have to do with the pool in the backyard 😉 ). Since Avery is still young and not talking yet, she occasionally uses sign language to get what she needs. Her new thing is to sign “more” while pointing to the refrigerator. I’ll pick her up and acknowledge that she must be wanting more food. We’ll walk over towards the Family Hub and open the doors to check out the food & drinks. She’ll kick her legs and throw a mini tantrum with her flailing arms. No mama, she wants to draw pictures on the touchscreen (wink wink). It makes here daddy and I laugh every day! I still remember waking up on my birthday a few months ago to see a sweet love note on the screen from my hubby. I saved it to my “favorites” folder. It’s easy to write memos for each other from our phones since it syncs easily to the electronics. 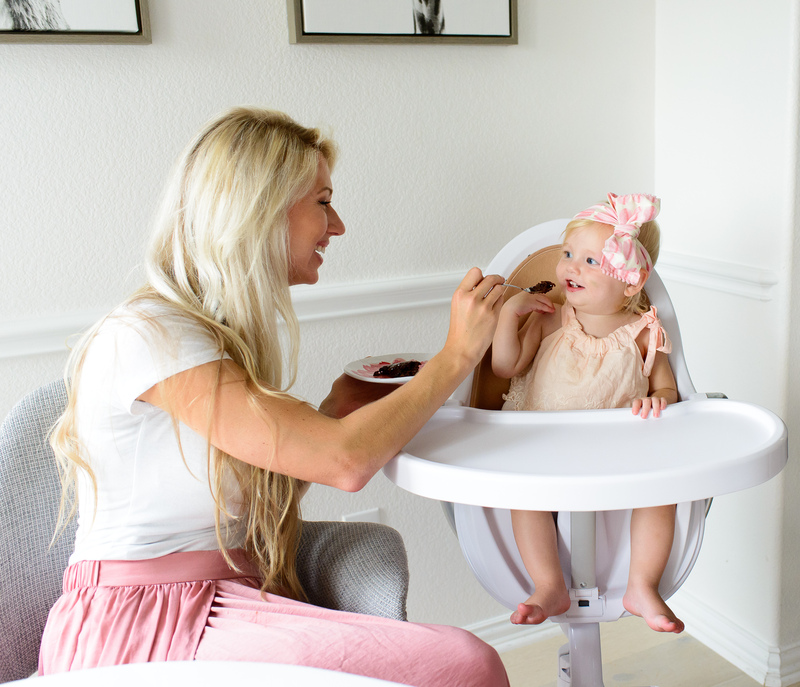 The Family Hub has a fingerprint resistant finish which is fantastic for having 8 tiny, smudgey hands on the loose. There’s a chrome accent piece that does leave fingerprints which I’m not fond of. Considering the rest of the refrigerator has the stainless steal resistant finish, it doesn’t bother me too much. The adjustable shelves is a favorite feature of mine since I can easily slide in cookie sheets or full cake sheets. I do wish the left side door had a bit more storage, for now it holds the kids applesauce pouches. The touchscreen has a shared calendar that syncs our family’s schedules from our phones. It’s been helpful to have all of our family’s events automatically added into 1 convenient place. 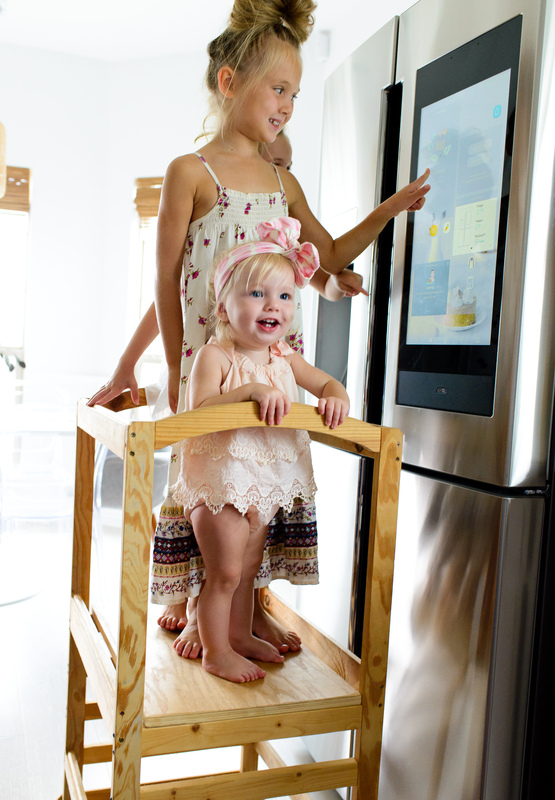 The refrigerator has a voice assistant called Bixby that can recognize up to 6 individual voices for commands, once Avery gets a little bigger I’m sure we’ll all annoy Bixby haha! The meal planner app has been super cool because it suggests recipes, searches for sales at nearby grocery stores, and has a one-touch ordering app to have food items delivered to my front door within 1 hour! 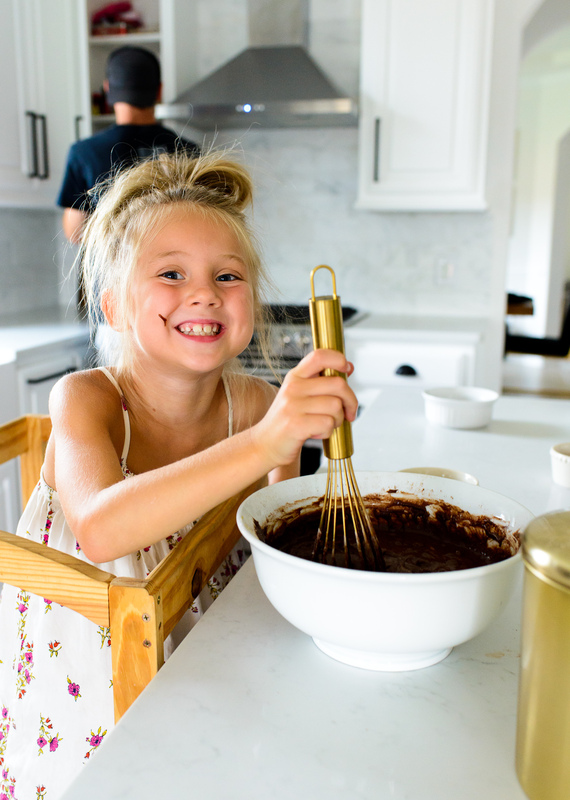 I’ve got to share with you our favorite family brownie recipe! 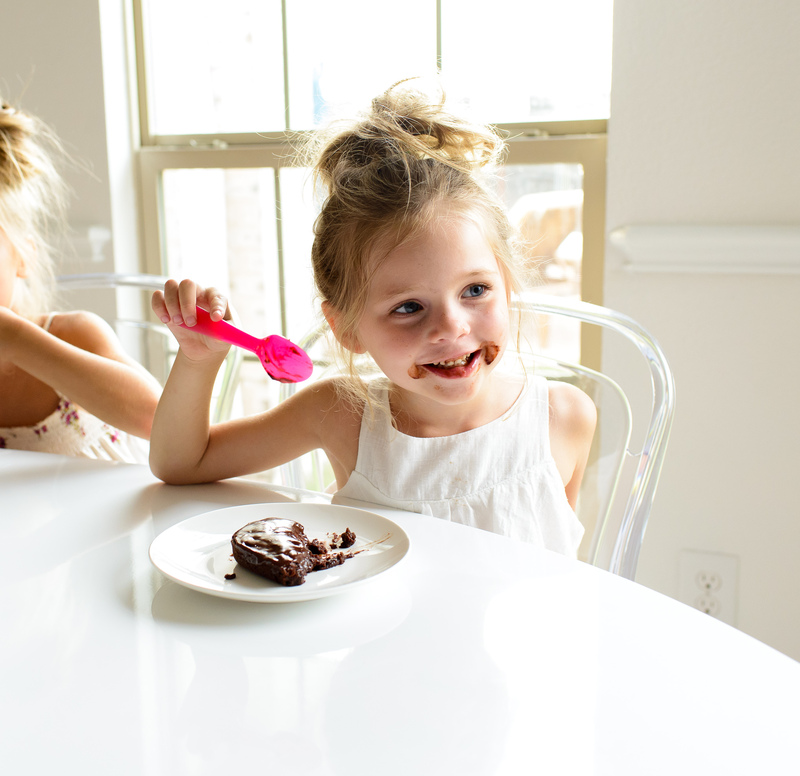 We got this recipe years ago from the sweetest cousins of ours, the Hiltons. 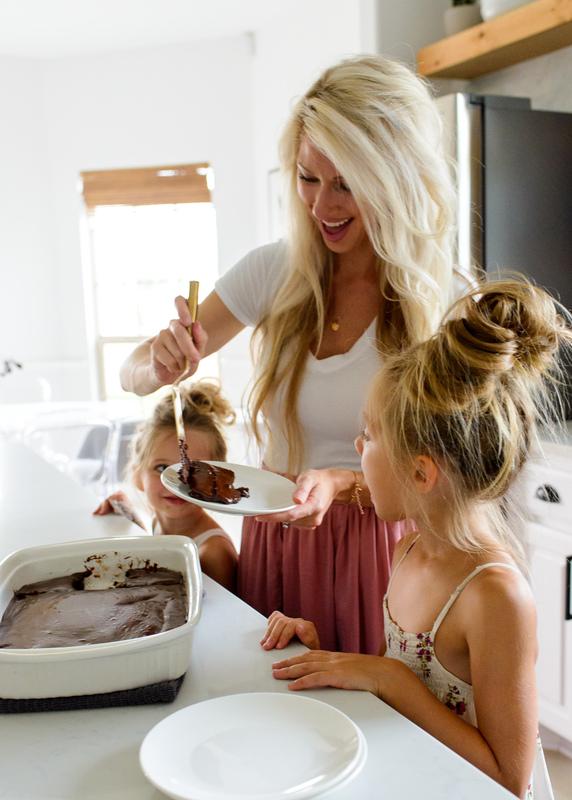 These are the most fudgey and rich brownies that have the tastiest chocolate icing slathered on top. The best part is it’s super easy to make. Preheat oven to 350 degrees F. Grease and flour a 9×13 inch pan. Melt the butter in microwave completely. 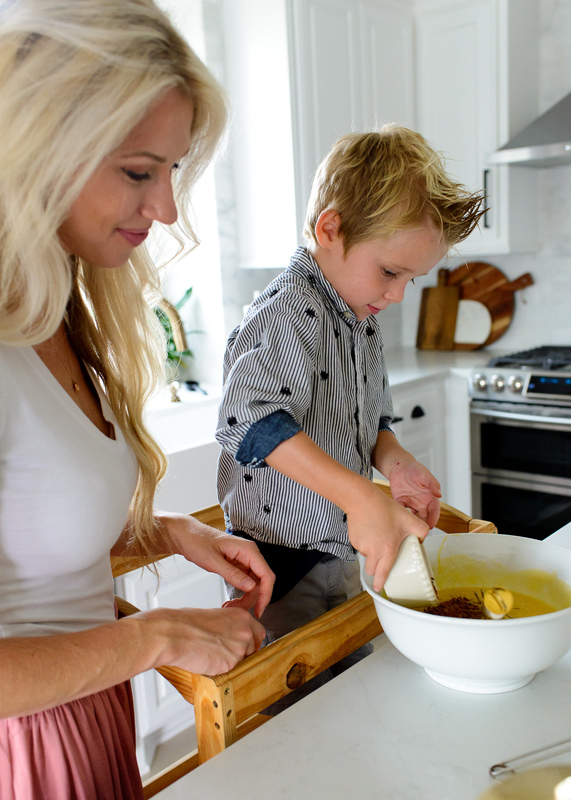 Pour into a large mixing bowl, add the butter and stir in sugar, eggs, and vanilla. Bleand until smooth. Beat in the cocoa, flour, salt, and baking powder until very smooth. Add the chocolate chips and stir until blended well. Spread batter into prepared pan. Bake in preheated oven for 25 to 30 minutes. Do not overbake. 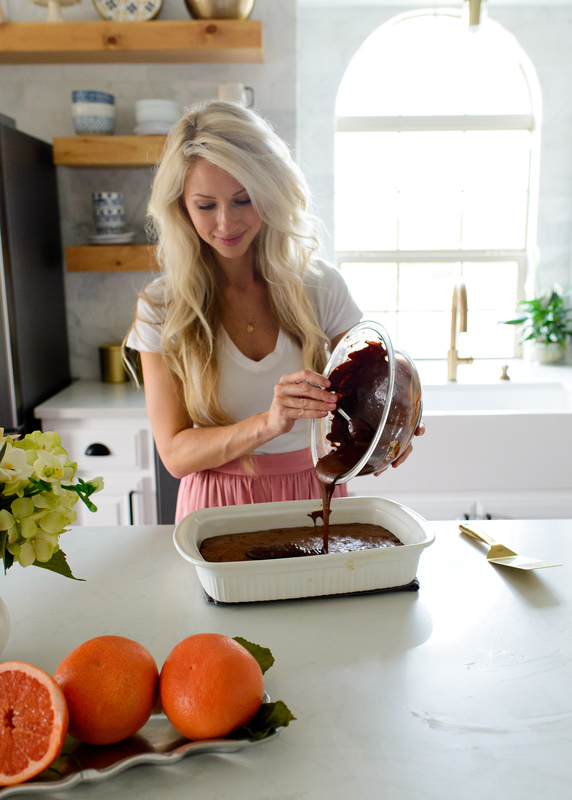 Remove from oven and allow to sit for 10-15 minutes and then spread the chocolate icing (recipe below) over the brownies while they are still warm. Combine butter, cocoa, honey, vanilla, and confectioners’ sugar. 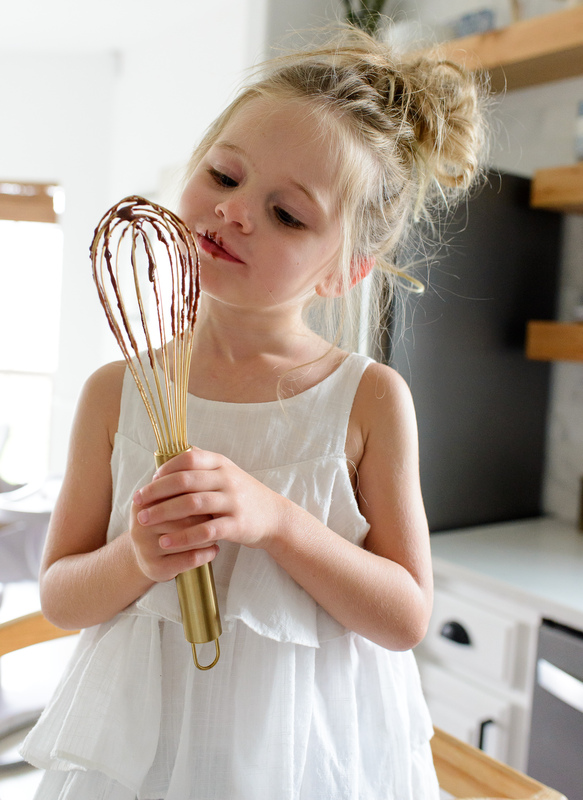 Add warm water, a teaspoon at a time, when you start to mix all the ingredients until desired consistency is achieved (thinner for cake centers, thicker for cake tops). HANDS DOWN, BEST OVEN EVER. 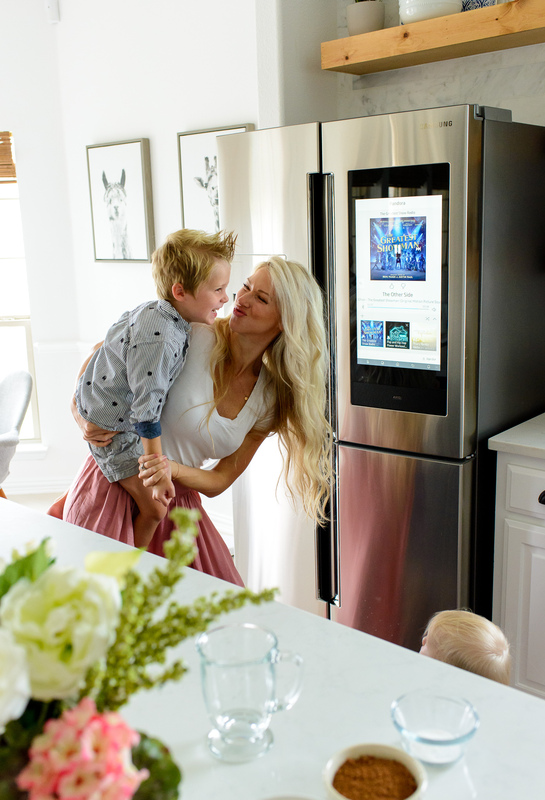 So, I partnered with Samsung for the Family Hub fridge and was stoked to share how much it’s been a dream in functionality and features. We also knew that we wanted a double oven. Our family loves to host dinners and it’s always been such a bummer to not have 2 ovens to accommodate our large dinner events. AND, the current Frigidaire single wall oven makes the loudest noise as soon as it’s turned on for the entire preheating time. It’s awful, and after replacing our Frigidaire dishwasher last week from constant issues I cannot recommend this brand. We walked up and down the aisle of the appliance stores to compare side by side the ovens on the market. We kept coming back to this Flex Duo range and was a few seconds away from purchasing the oven when my friends at Samsung offered to let me review the oven. The number 1 reason we love this oven is the dual door. It has a removable divider that converts one oven into two to cook multiple dishes at different temperatures at once with a door that can adjust for use of the top or full oven. Mind-blowing, right? 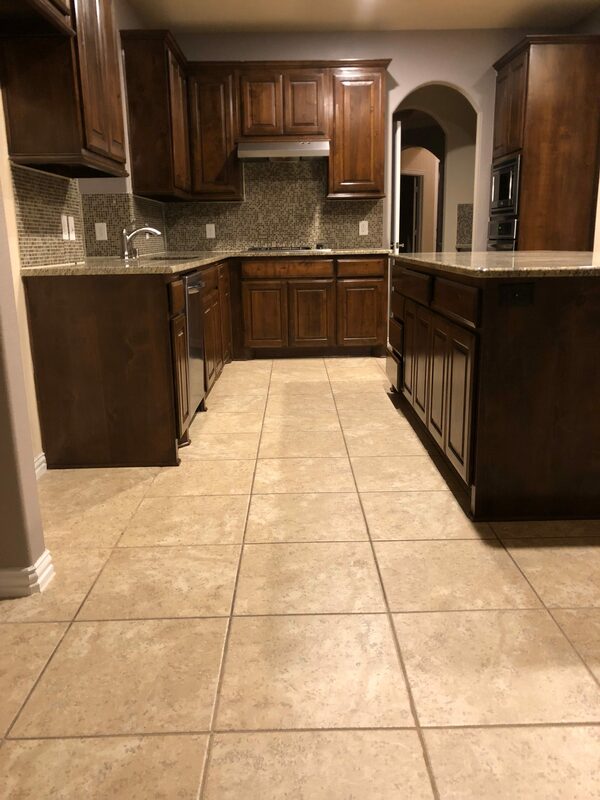 It’s perfect for full-use cooking a large Thanksgiving turkey or a complete dinner with a pizza cooking in the top oven & a sheet of chocolate chip cookies baking in the bottom oven. Most of the time when it’s just us, we’re simply cooking one pizza or casserole, so it’s awesome just heating the top oven since it heats up so much faster than a typical oven. I chose the convection gas oven and the average cook time has dropped from 30 minutes to 20 minutes while keeping food perfect and full of moisture! The blue LED lights surrounding each knob light up when the cooktop burner is in use. That gives some peace of mind with having curious kids! The oven has wifi built in which let’s me adjust the temperature and time from my phone while I’m out of the house. I’ll turn the oven on while I’m at the grocery store so that it’s perfectly preheated to cook dinner as soon as I get home. Or I’ll have the dish inside the oven and will turn the oven on so the dinner will be ready to eat when we step inside the door. It’s very cool and convenient! The gas range looks high end and is well designed! When I need to quickly boil a pot of water I’ll use the dual burner that has a powerful, wide flame. There’s a TON of temperature settings! 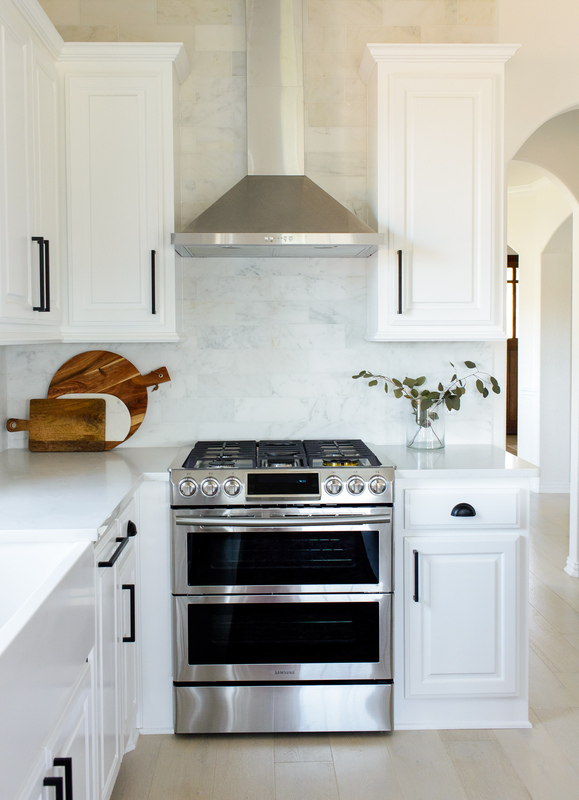 We’ve always loved a gas stove for how quickly things heat up and this duo oven gas range is definitely an upgrade! Thanks to my awesome sponsor Samsung for partnering with me in this kitchen renovation! 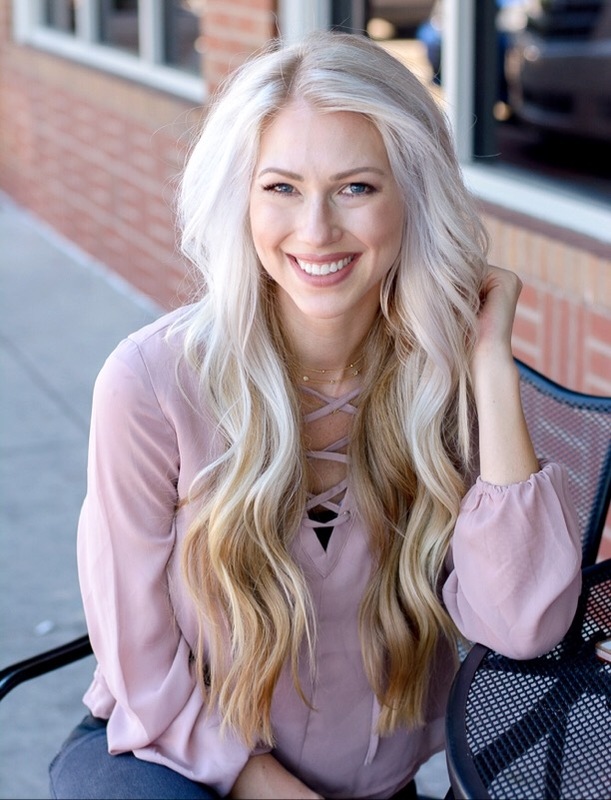 And thanks to y’all for supporting the brands that help my family & Hello Ivory Rose blog! 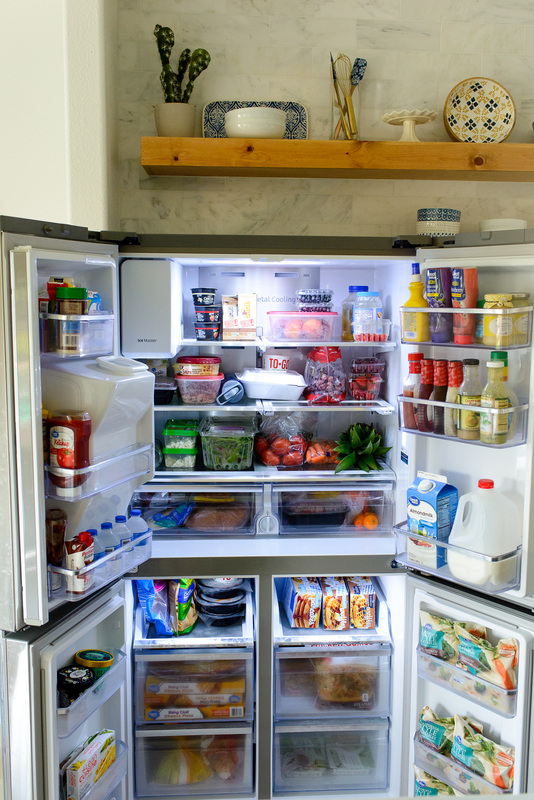 What style refrigerator do you prefer?! A side by side? A freezer on the bottom? Tell me in the comments! 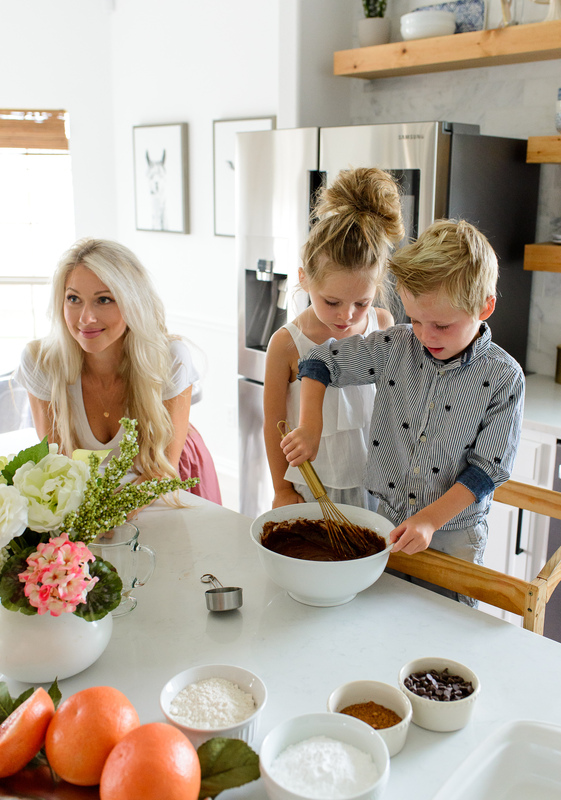 Where are the kitchen tall stools from? Love them! I have that same fridge! I love it. Also, I’m so trying that brownie recipe ASAP! Lovely pink skirt! What brand is it? That brownie recipe looks pretty nice. Great Post!